The amazing MUSYSIC MU-PM8C Powered Mixer packs tremendous power (4000 Watts PMPO / 2000 Watts Program / 1000 Watts RMS / 2 x 500 Watts RMS), while maintaining an incredible power-to-weight ratio. These mixers employ high-efficiency technology and a state-of-the- art switch-mode power supply, which significantly reduces weight and heat. The 8-channel MU-PM8C features 8 built-in, studio-grade mic preamps, 2 stereo channels, a 16-bit DSP Multi-effects including studio-class reverbs, delays, and various multi-effects, plus a 5-band stereo graphic EQ. 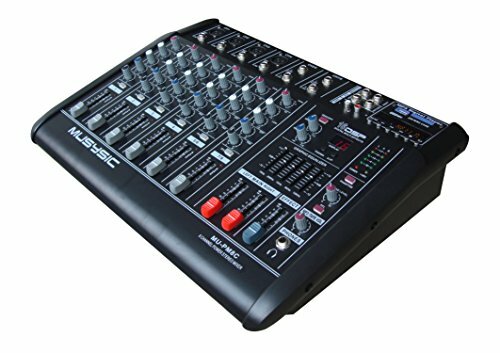 The MUSYSIC MU-PM8C power mixer was developed using the expertise of professional sound engineers and working musicians. For its price range, it's rare to find a mixing console that compares with the MU-PM8C's awesome performance, flexibility and crystal clear sound quality. Specifications: 8 input mono channels and 2 stereo balanced inputs Build-in amplifier 4000 Watts PMPO / 2000 Watts Program / 1000 Watts RMS / 2 x 500 Watts RMS Ultra-low noise discrete mic preamp with +48V phantom power Extremely high headroom-offering more dynamic range 16 DSP Multi-Effects USB/SD slot for MP3/WMA Format direct play Balanced inputs for highest signal integrity Ultra-musical 2-band EQ on all channels Peak LEDs all mono channels 1 Aux send per channel for extrenal effects and monitoring Master mix output and REC output Highly accurate 5 segment bargraph meters Seperate master mix outputs 5 Band equalizer Headphone output jack 4 Speaker output (2 1/4" & 2 Speakon) 110V/220V switchable Weight: 21lbs Dimension: 20.8"x15.3"x7.8"
If you have any questions about this product by MUSYSIC, contact us by completing and submitting the form below. If you are looking for a specif part number, please include it with your message.